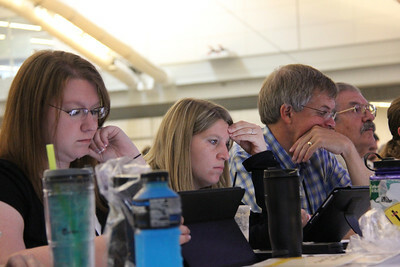 Voting members participate during the second plenary on Tuesday morning, August 13. 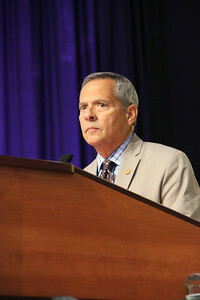 Carlos E. Peña, vice president of the ELCA, waits for the Tuesday session to begin. 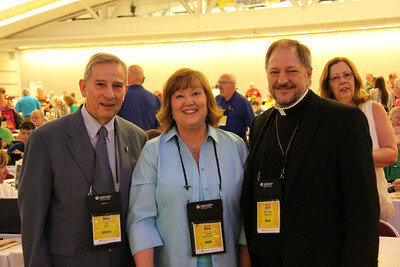 ELCA churchwide staff members prepare for the day. 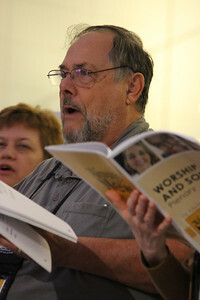 The Rev. 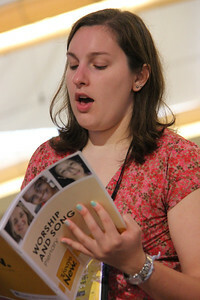 Rachel Connelly invites the Assembly to stand and sing a hymn. 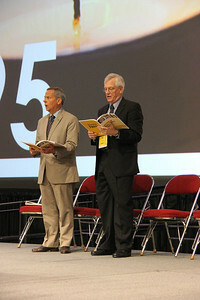 Carlos E. Peña, vice president of the ELCA, and David Swartling, secretary of the ELCA, sing during the morning plenary. 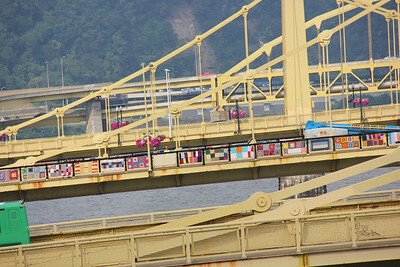 The Rev. 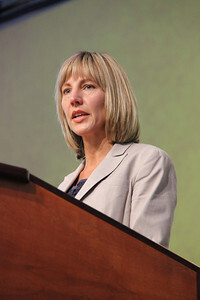 Rachel Connelly speaks to the Assembly. 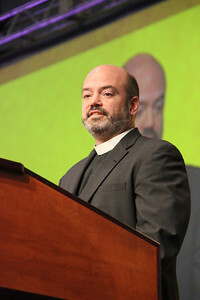 Carlos E. Peña, vice president of the ELCA, David Swartling, secretary of the ELCA, and the Rev. 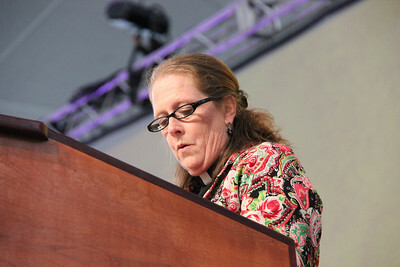 Rachel Connelly, a member of Church Council from North Carolina, lead the Assembly. 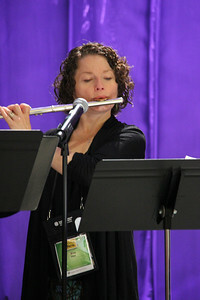 Talented musicians accompany the Assembly participants. 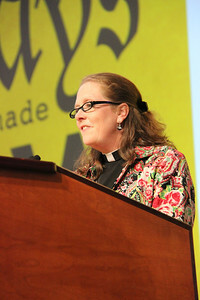 The Rev. 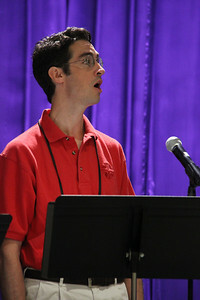 Jonathan Eilert, chair of the Nominating Committee, gives the committee’s report. 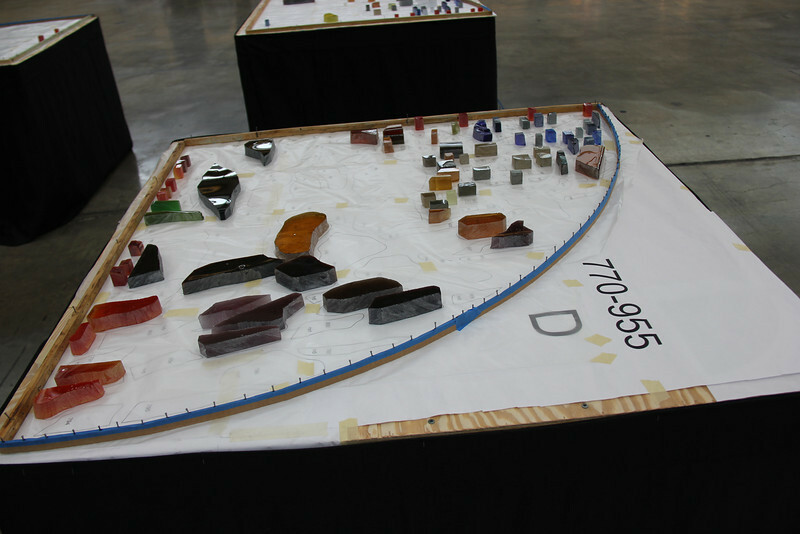 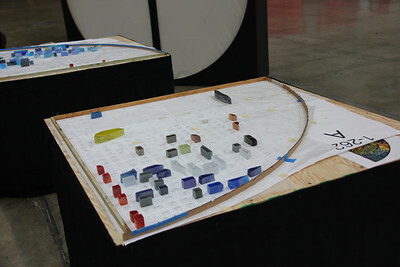 Voting members at the 2013 Assembly will help create a stained glass window. 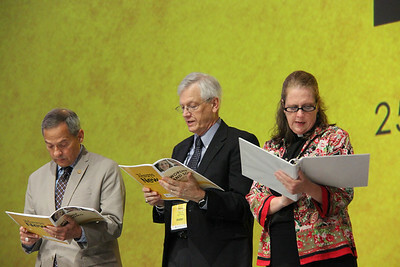 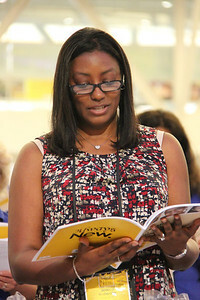 Voting members review their Guidebook during the second plenary on Tuesday morning, August 13. 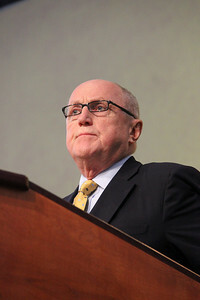 The Rev. 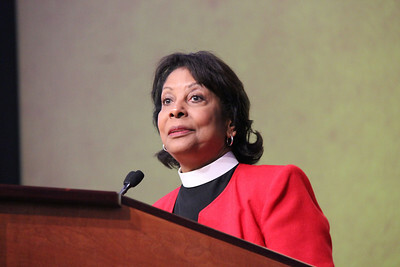 Wyvetta Bullock, executive for administration in the Office of the Presiding Bishop, gives a presentation on the 2014–2016 proposed budget. 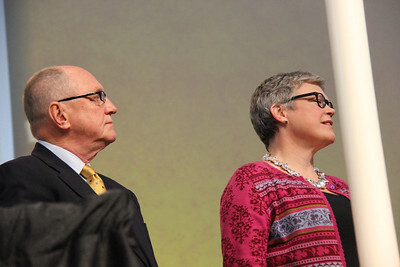 Louise Hemstead, a member of Church Council, introduces the ELCA 25th Anniversary Campaign. 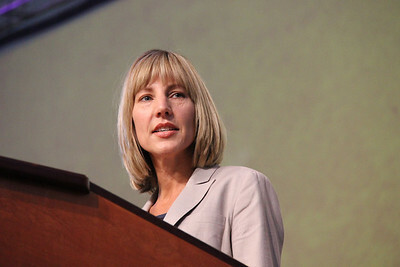 Christina Jackson-Skelton, executive director for the Mission Advancement program unit, shares details of the 25th Anniversary Campaign proposal. 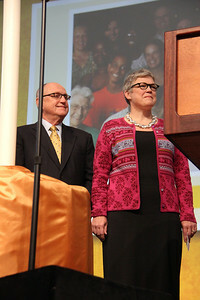 MaryAnn and Loren Anderson will serve as chairs of the ELCA Campaign Steering Committee, should the Assembly approve the 25th Anniversary Campaign. 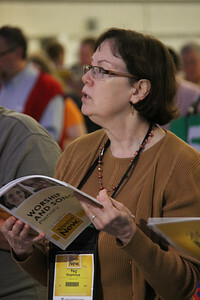 MaryAnn Anderson, an ELCA member from Minneapolis, provides additional background on the 25th Anniversary Campaign. 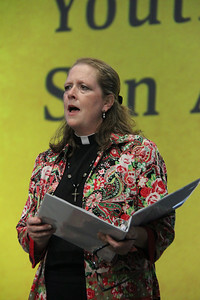 Loren Anderson, an ELCA member from Minneapolis, provides additional background on the 25th Anniversary Campaign. 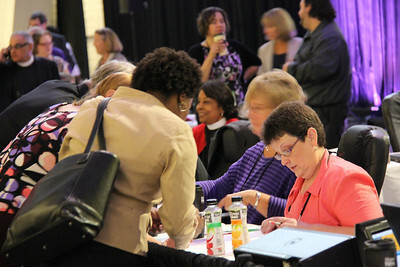 The Rev. 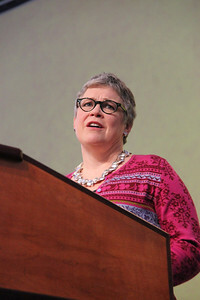 Rachel Connelly, a member of Church Council from North Carolina, presents the Book of Faith initiative as the next item of business. 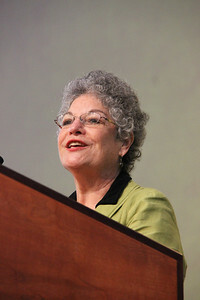 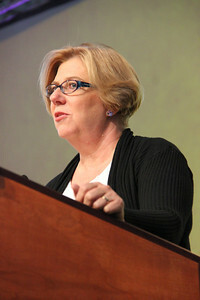 Dr. Diane Jacobson, professor of Old Testament at Luther Seminary and director for the Book of Faith initiative, addresses the Assembly. 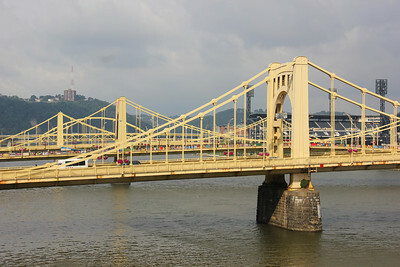 Assembly voting members, guests and volunteers enjoy a view of the Allegheny River next to the David L. Lawrence Convention Center. 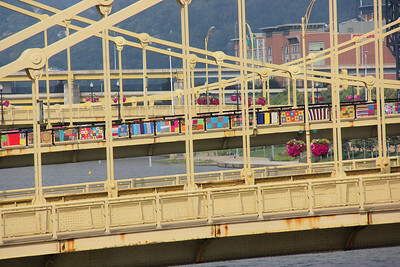 An art project in Pittsburgh, consisting of 600 colorful knitted quilts, decorates the Andy Warhol Bridge.